Andromeda is both a physical children's book and a digital book with AR codes that needs to be read with the use of a webcam. The human reader shows the book to the machine, and the machine reads the code that is provided in the cards that are attached to the pop-ups. The human reader then sees on the screen what the computer has in a sense translated into human languages. The complexity of reading and the double process of decoding is thus one of the more interesting and significant issues of the project. The use of a children's book in the project is significant because the symbolic process that takes place while reading the text is linked to the diegetic scene of a mother and a child reading a fairy tale. Author description: Andromeda is an augmented reality journey poem about stars, loss and women named Isabel, enabled by a unique software solution and a custom marker library. Augmented reality overlays digital imagery on physical objects and in this piece, the power of robust, multiple, simultaneous recognition with sound activated through proximity has been made easy to work with through the addition of a MAX/MSP interface. It is a unique authoring environment and a wonderful medium for poetic expression. Andromeda is the first fully realized poem written using this software, but is part of a larger suite of poems, tabletop theatre, web-viewable and immersive augmented reality fictions being built by Fisher. 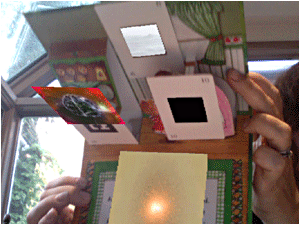 Andromeda uses a found pop-up book, overlaid with augmented reality markers. Instructions: The poem is brought to life when a reader, using a camera attached to a computer, unlocks the textual, video and audio elements associated with the markers -- the basic idea being that the camera 'sees' these symbols being explored and overlays digital content. The resulting poem can be viewed on the computer screen or through a head-mounted display. The video here is merely suggestive of the experience.